2. Cut the onions into large cubes & finely chop the ginger. The garlic can be left whole by just removing the skin (if you are using Indian garlic). Slit the green chillies into half. 3. 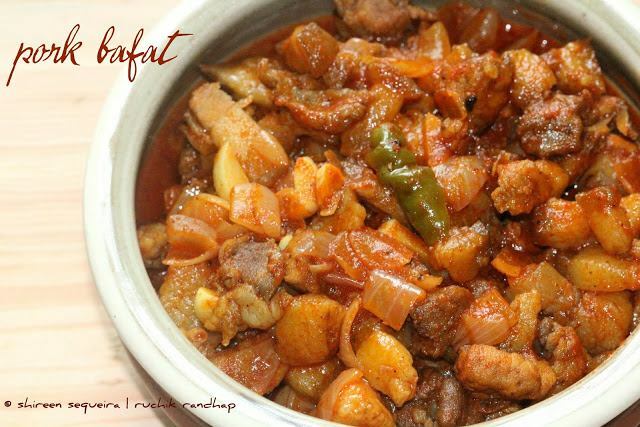 In a pan put the meat along with the chillies, ginger, cinnamon, cloves, bay leaves, salt, tamarind juice & bafat powder. 4. Cook on slow fire till almost done & then add the onions & garlic. 5. There is no need to add water unless the meat is with almost no fat. @Anonymous: So glad u were able to make it – Pork Bafat I assume or was it the powder u made? Either ways, glad I was of help!! Hi Shireen, I was looking for an authentic Mangalorean Pork Bafad receipe, and yours was the first that came up. It is an hour later and I am still looking through all your posts. It's making me crave good mangalorean food. And more so bringing back some wonderful memories of my late grandmum. Thanks. Good luck and keep up your great work! Thanks so much for the lovely compliments! I hope you enjoyed your time browsing through my blog and I do hope you cooked a dish or two & relished it too! I'd love to hear your feedback whenever you are able to! Take care! I am a Mangy living in Melbourne and married to a English. He loves Indian food. I love cooking for my family. keep up the gr8 work. u r awesome! I would like to try your Pork Bafad recipe. You have mentioned 2-3 tsps of tamarind juice. Will that suffice for a kilo of pork. Hi Anna! Thanks a ton for your wonderful comment and so sorry to have missed responding to it on time. I am thrilled to know that you enjoyed the Dukra maas with your family 🙂 glad to know that my recipes help you reminisce ur time in Mangalore! Have a wonderful year ahead! I have lived in Melbourne, Australia for several years, never saw bafat powder anywhere. Do you know if it is available here. Any help would be much appreciated. I have lived in Melbourne for over 17 years and never heard the word Bafat Powder anywhere as much as I would have liked to. Would you or any of your blog readers known where I can purchase this item. I have replied to your query above! Am Nitin Dias. Your recipe reminded me of my Mum's made Dukra maas. Picture resembles very much. 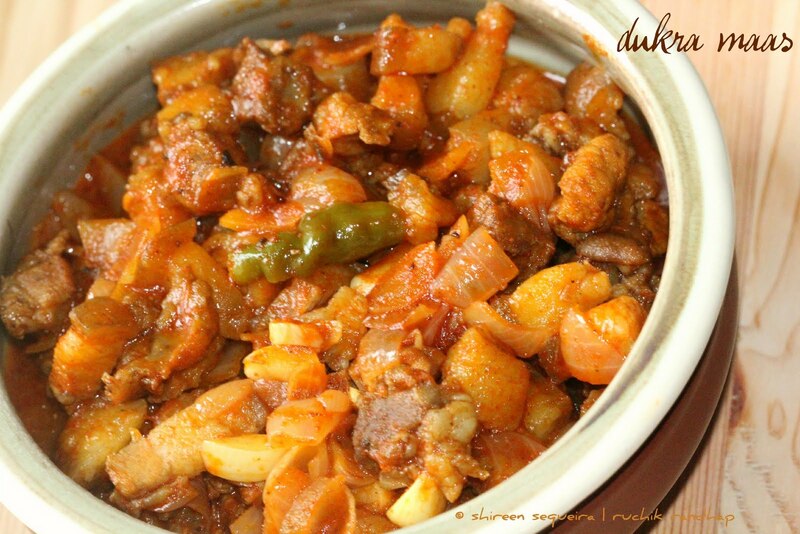 I live in London and its been more than a year since i had Dukra maas. So i'm going to try cooking that for this christmas. Hopefully i'll get all the ingredients. Your recipe would be of great help in cooking. Thank you very much. Hi Shireen, I tried this recipe a couple of weeks back and it came out good. I have tried recipes from different websites become, but they were nothing like your recipe. Everyone liked my Pork Bafat. I bought Pork Picnic Roast (Pork Shoulder) from a local store here and my wife helped me search for recipes from google and found your web site. Your website is so well organised with such good quality pictures. @ Stany DSouza: Thank you so much for your feedback and I am glad that you enjoyed this recipe 🙂 Thanks for taking the time to write to me, appreciate it! How are you? I am Daisy from Bombay. Hi Shireen. I have tried out your recipe and enjoyed it very much. Thanks a lot! @ Janice: So glad to hear that 🙂 Do stay tuned for more recipes! what part of the pork do you use for this? Hi Shireen, any particular reason that the onions and garlic are added halfway through ? Thanks for the recipe, this one's a keeper. @ Gopal: So happy to hear that and I am sure my mum will be too! Thank you for trying out this recipe and for sharing your feedback 🙂 glad you enjoyed it!